Want to try out the experience of riding your bike and camping out? We've been promoting the idea of the Sub 24-Hour Overnight for a number of years, with an article in Ohio Sports & Fitness, plus reports from our staff of their own bike-camping trips. 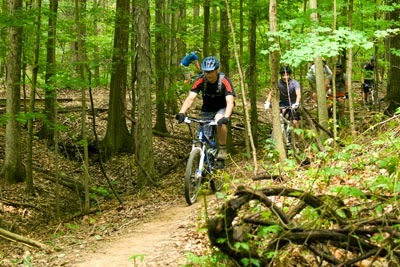 The Cleveland Metroparks is offering you a gentle introduction to overnight biking and camping. Their Pedal the Parkway Campout will be held on September 6 - 7, 2014. All you have to do is show up with your bicycle and camping gear (if you don't have a tent, you can rent one). You can select a different bike ride both days, with options of 15, 35, or 50 miles. All rides begin and end at the campsite location in Bonnie Park Picnic Area in the Mill Stream Run Reservation. Dinner and activities in the evening are included, as well as breakfast in the morning! Thanks for joining the Global Solidarity Ride! Ales were hailed, bikes were ridden at night. Final week to WIN with the Summer Biking Spree! Poll: How do you feel about electric bicycles?